Welcome to Great Design. This website will look at the best designs on the internet. As well as tutorials teaching you how to produce amazing designs and get good looking results. Sorry for the lack of updates. An Aperture tutorial will be here tomorrow I have been really busy at school. Any way if you want this weeks wallpaper you can cast your eyes down to the image below. 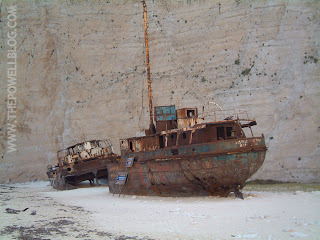 Again this was taken on my holiday in Greece and it was one of the ship wreaks. It's made out of iron and was deserted for a long time. You can click the image for the full version. If you are interested now is the best time if you want to buy a Mac and iPod since Apple are offering there back to school promotion. You can check it out here. My name is James, I currently live in the UK. This blog is all about a creative outlet for all my design inspirations. It is going to be all about design, ideas, trends, tutorials and everything in the design world. Please remember to subscribe to the RSS feed.Please note © James Powell. All rights reserved.